‘Place of Trust’ (in both its English and Welsh versions) was specially written for the RE Council’s Celebrating RE month, March 2011. 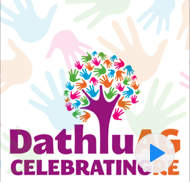 The resource provided a shared song of celebration, linking together young people from across Wales and England as they celebrated RE in their local and national contexts. The song, however, has a relevance that goes far beyond the Celebrating RE month of 2011. Religious Education in Wales and England today provides a place where young people are able to engage with fundamental questions, to explore beliefs, teachings and practices, and to express their personal responses. This means that Religious Education is involved with questions and issues which can be both personal and sensitive. This background provides the context for the central theme of the song, the ‘Place of Trust’ or haven where young people can learn about themselves and others in a supportive and respectful environment. The song appreciates the need for and the value of such places of meeting, and welcomes the relational potentialities and challenges that these may bring. The song was released by Stiwdio Sain, featuring Dafydd Dafis, Eleri Fôn and Ysgol Tryfan choir, and is available to purchase as an iTunes download. Copyright information: Schools, faith communities and other non-commercial groups have permission to use the downloadable music backing track and to make copies of the score and words for their performances of the song.